This performance of Bánk bán (the title roughly translates to Bánk the Viceroy) was the opening event of a two-week Hungarian National Opera festival at Lincoln Center, with that opera company taking up temporary residence in the David Koch Theater on the south side of the plaza. The event featured a private United Nations reception on the theater Promenade, a short speech beforehand, and luminaries in the audience like Hungarian president János Áder and opera superstar Plácido Domingo, and a crowded house of Hungarian and American opera lovers. 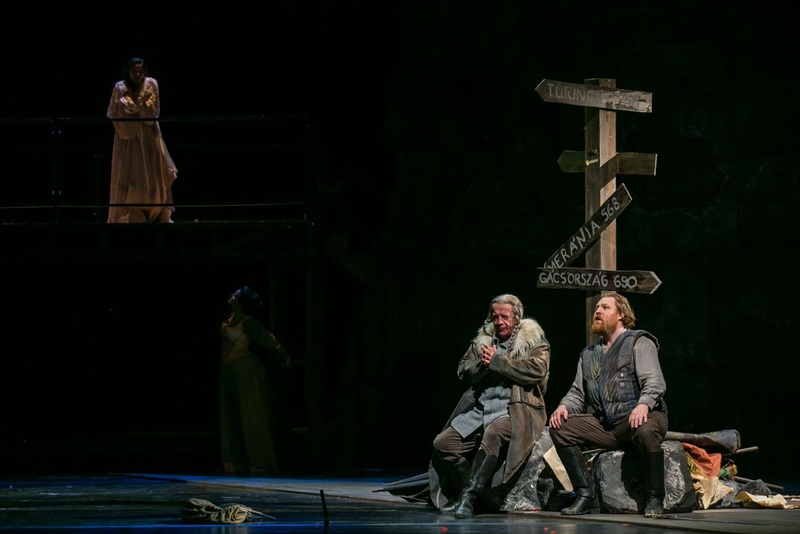 Erkel's opera is based on a real incident in Hungarian history, the assassination of Queen Gertrude (Judit Németh) by the heroic and self-sacrificing Bánk (Levente Molnár). He is a noble hero in the tradition of Rossini's William Tell, putting the interest of the state before the safety of his family with predictable and tragic results. The opera has the same place of patriotic pride with the people of Hungary as Sibelius' Finlandia does for Finns, and Verdi's "Va pensiero" chorus does for Italy. The opera it most closely resembles is the latter's La Battaglia di Legnano, an explicitly patriotic work that is Verdi's most political opera. In the course of these stormy events, Bánk's wife Melinda (Zita Szemere) goes mad in the Donizetti style, having three mad scene arias that allowed the soprano complete command of the stage. The first of these was the best, accompanied by the use of a solo violinist (actually playing on the left lip of the stage so as to be better heard) and a cimbalom (a folk instrument similar to the hammer dulcimer) that provided color from the pit. Ms. Szemere's slight but agile soprano was a highlight of the evening, even as she fought to avoid the acoustic dead spots that plagued the New York City Opera once upon a time. Mr. Molnár played Bánk with a heavy presence and tragic weight, using his large and durable instrument to good effect. His character shone in his Act II aria, which is the opera's best known excerpt. Here, Bánk's simple determination and patriotism comes to the fore. This was followed by the opera's best and most musically ] interesting scene, a meeting with a mysterious man (István Rácz) who turns out to be Tiborc, the soldier who saved Bánk many years before the opera. This melding of the two deep voices was particularly effective, as the men traded lines before finally singing together: another Verdian device. Less successful was the movement of the chorus on Oleksandr Bilozub's awkward set, which featured a large revolving panel door on one side that was meant for quick scene changes but looked clumsy and ill-made. Other effects, like the rippling curtains and hissing fog machines that accompanied Melinda's suicide aria provided unintentional distraction from the music. Less forgivable, the presence of four pallbearers carrying small plain pine boxes for Melinda and Bánk's young son. Meant to be a harbinger of death, they merely fouled up the onstage traffic. Although the hard-core lovers of this opera (and there were a lot of those in this audience) hung on every word sung from the stage (helped by projected titles in both English and Hungarian) the problematic acoustics of the Koch Theater and the fussy, busy direction from Attila Vidnyánszky served to muddle the plot and point of Bánk's tragedy. The saving grace throughout was Erkel's bold and inventive score, conducted lovingly by Balázs Kocsár in the pit. This performance showed that in opera, music remains powerful language of all.